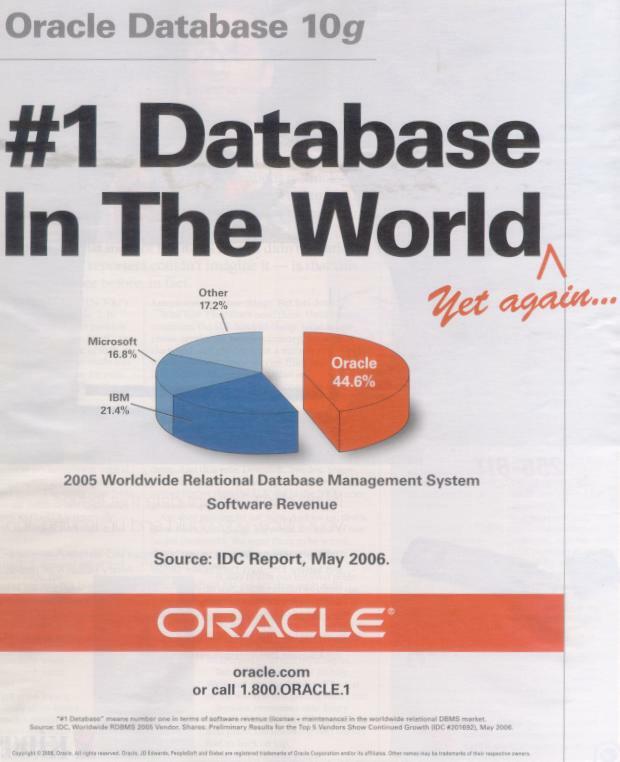 It may seem that way, I don’t mean to pick on Oracle, but lately I've seen a number of boastful ads from the database and CRM giant in various media that makes me a bit wary of this company. Gloating in ads is nothing new. Politicians do it all the time and so do many other companies. 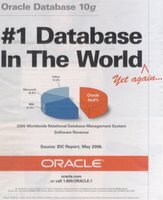 Oracle and other companies in their field have been engaged in negative advertising for quite some time, but recently Oracle ads have had nothing to say other than bashing their competitors. There's nothing wrong with that, but I wonder if the exposure gained is the type that this company really wants. I, for one, am not a big fan of braggers, specially if that's what all a company does to promote itself and its products. In my mind that actually lowers a company's stature and makes me more cynical of their operations. Take a look at the first ad. It was on the back cover of a recent issue of Computerworld, a popular trade publication in the IT management industry. I understand what this ad is trying to convey, but then there's more than one way to read it. So Oracle revenues beat those of their competitors, but that also means that more money was invested in non-Oracle databases. It could also mean that Oracle is overcharging its customers for its products and services. Why don’t these customers switch to cheaper alternatives? Perhaps Oracle products are so entrenched in their operations that they don't dare extricate them. In other words, some may just be hostages to Oracle's tactics. Yet still this ad is totally useless in comparing the installation bases. I have a hunch that MySQL (a generally free and popular database product) by itself has a much wider number of installs than that of Oracle database. But that message is lost on the casual viewer who only sees the #1 claim printed in a super-sized font and the supporting pie chart below that. The second image is a partial snapshot taken from Oracle's homepage that was running until recently. Again, I can understand that Oracle is touting its earnings momentum, but what's all this competition bashing? A casual browser would have no idea how Oracle arrived at the conclusion that its earnings grew 5 or 6 times faster than those of its competitors. Oracle has swallowed up a lot of companies recently, so their comparison methodology may not be as straightforward as it seems. In other words it could be all smoke and mirrors and not based on an apples-to-apples comparison. And still, it could again mean that they are more successful at overcharging their customers. Oracle's blustering and showboating might please their shareholders who are interested in the bottom line, but as far as attracting new customers, perhaps it's time to cut back on bashing competition and focusing on the strengths and merits of their own products. Otherwise they might as well also brag about being #1 in their number of ads about being #1.